One of the many pleasures of staying at The King and Prince Beach & Golf Resort is the magnificent culinary experience! 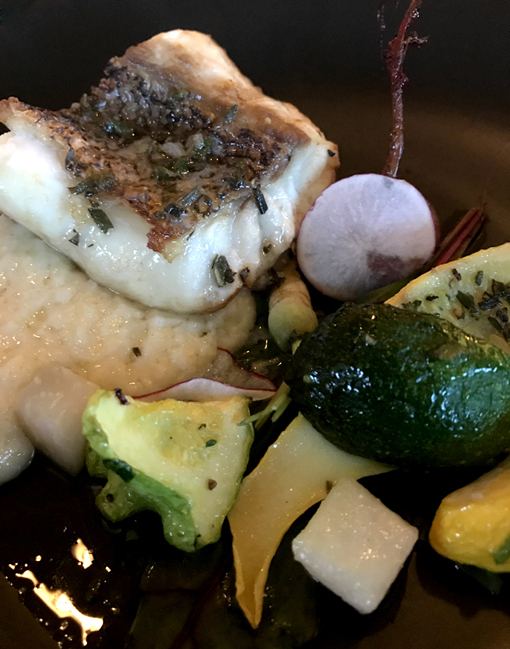 I was recently a guest of The King and Prince when I and fellow media guests enjoyed quite a lot of the food and beverage the resort has to offer guests, but the dining adventures didn't stop there. Important to experiencing the whole of a destination, our hosts felt it important to savor other flavors of St. Simons Island. I'm going to share some of those with you here. On the occasion of our final evening together, our group was treated to a most divine Wine Dinner, one unlike any other I've had the pleasure of enjoying. If this is how Executive Chef James Flack cooks the rest of the year—and I got the distinct impression it is—every guest at The King and Prince is in for a culinary delight! Our wine dinner started with a reception when we enjoyed bubbles and each others delightful company. By this point, I'd met most of the others in the media group—this was a working trip, so our schedules were quite tight—so this reception was a great opportunity to connect with a few more and to chat with newly made friends. Everyone dressed for the occasion! It was akin to dining at the Captain's Table on a cruise ship. In the Retreat Room, we had a panoramic view of the ocean, flanked by palm trees swaying in the coastal breeze. Our first course was dramatic! Through a glass dome, we could see a tiny billowing cloud surrounding our Smoked Sea Scallops. 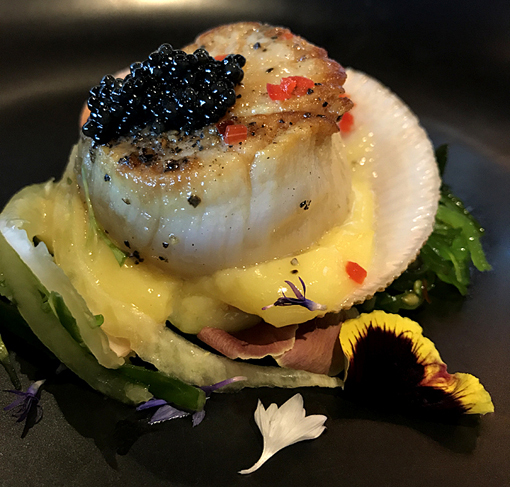 Centered in a shell on a pool of lemon curd, the perfectly seared scallops were topped with Georgia caviar and pepper brunoises. It was as visually stunning as it was delicious! Our second course at the Wine Dinner was my personal favorite! Gorgeous, isn't it? 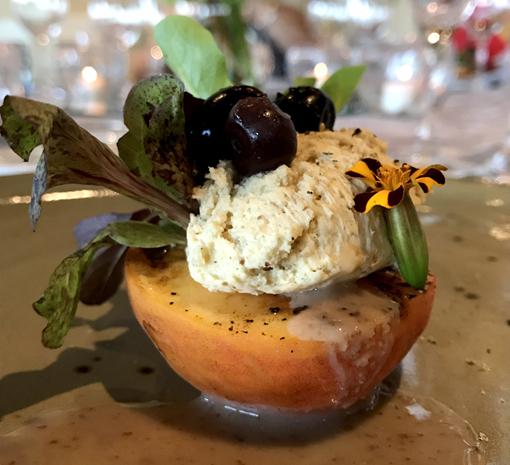 It was a Grilled Georgia Peach topped with foie creme fraiche, pickled blueberries, summer greens and maple-pecan dressing! Have you ever in your life had such a decadent salad? We enjoyed this course with Cambria Voignier. I had the pleasure of sitting next to our wine presenter that evening, Michelle Schmitt of Jackson Family Fine Wines. When enjoying fine dining, I'll typically have a pre-dinner cocktail and then switch to wine to enjoy with my dinner. The wines at this particular dinner were exceptional, as was Michelle's presentation of them. Not only is she extremely well versed in the resort's wine list, she's incredibly funny! 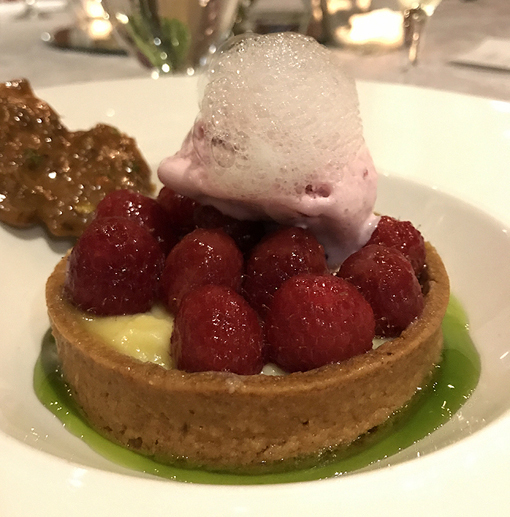 The dessert course at our Wine Dinner was a Raspberry Tart topped with a bushel of raspberries, strawberry-rhubarb ice cream, a most decadent pistachio brittle (seriously good! ), and mint foam, all surrounded by a moat of kiwi gel. Coupled with Benvolio Prosecco, fresh-brewed coffee, and delightful dining companions, this was a wondrous crown to a delightfully indulgent, exquisite dining experience. It was apparent—in the taste, presentation and introduction—just how much Chef James enjoyed creating and preparing this meal. He was modest about his success, but we were not with our applause. One first dinner together was when we first met Executive Chef James Flack who treated us to a cooking demonstration! The humongous fish above—there were two displays of this—came with credentials of being fresh and locally caught (the slip of paper on the display). They were Black Grouper and Red Snapper! This dinner was in the 'Solarium', located in the historic part of the resort! It too has a magnificent view of the beach and ocean. 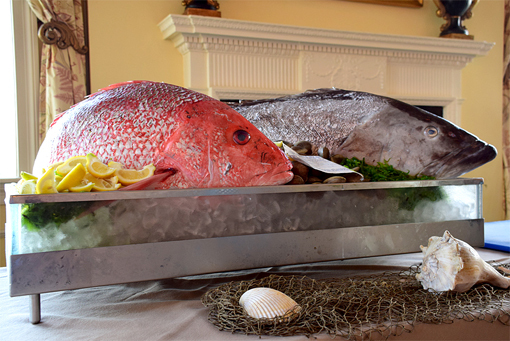 After Chef Jame demonstrated how to expertly filet a fish, our servers bought to our tables expertly prepared grouper! The sauteed fresh, crisp vegetables were amazing—I'm salivating as I write this—and the grits, Gayla's Grits from Lakeland, Georgia, flavored with Gouda cheese, were spoonfuls of heaven! Breakfast at Sandcastle Cafe, locally-owned and serving breakfast since 1989, was out of this world! In addition to their famous buffet, we were treated to French toast and waffles and juice and coffee! I had to try a little of everything (that's my plate pictured above), and it was a good thing...we had a full day of tours ahead of us! Everything was delicious! 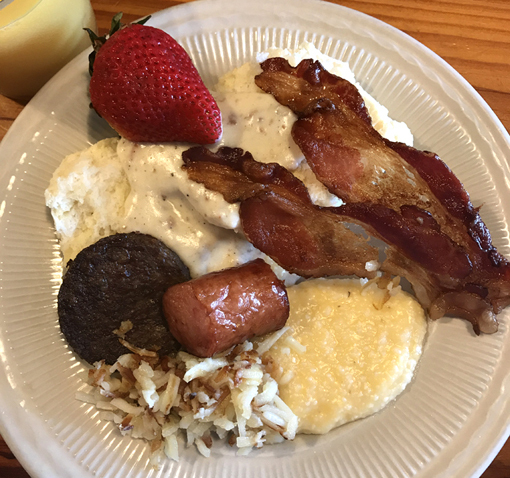 The grits were amazing, the biscuits and gravy were amazing, and the bacon was perfectly cooked. I'm not inclined to give a two-thumbs-up to biscuits and gravy unless it's well deserved. My mother made the best in the world, so when someone approaches that splendid childhood food memory, as did Sandcastle Cafe, I find myself in awe...between bites, that is. After a first full afternoon and evening, we were on our own for breakfast on the first full day of the trip. Of course, we media folks found each other, so no one dined alone. I enjoyed the morning meal with my dear friend Patti of Anatomy of a Dinner Party and our new friend Renata of TALK Magazine. We dined at Echo, the resort's crown jewel of dining options. The restaurant is appointed with elegant nods to the resort's connections to WWII naval history. And it's conveniently located between the main lobby and the beach! I had a breakfast sandwich unlike any I've ever had...the Fried Green Tomato Po-Boy! Wow! It was amazing...truly. 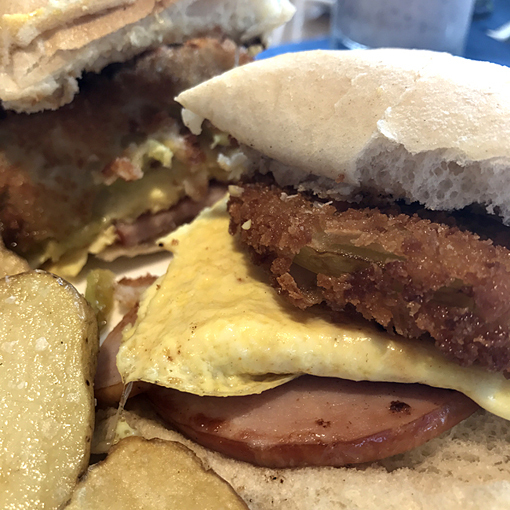 This po-boys is made with scrambled eggs, ham and Swiss cheese, and served with breakfast potatoes and a miniature parfait. If you leave hungry, it's your own fault! My mother never made friend green tomatoes, but when I was in grade school one of the neighborhood grandmothers did. I ended up loving what as a kid I thought was experimental cuisine—I'd never heard of cooking tomatoes that weren't ripe! But, man did they taste amazing. It wouldn't be until I was an adult that I would have them again. Now I enjoy them every chance I get. I used to live by the strict rule of "Never Eat Cajun in Illinois" because I once had "Cajun" Red Beans & Rice at a restaurant in Illinois that tasted like it was out of a can. Blech! Don't get me wrong, I've had AMAZING food in Illinois, but that particular instance had me ordering the "local" cuisine of cities I visited for many, many years. 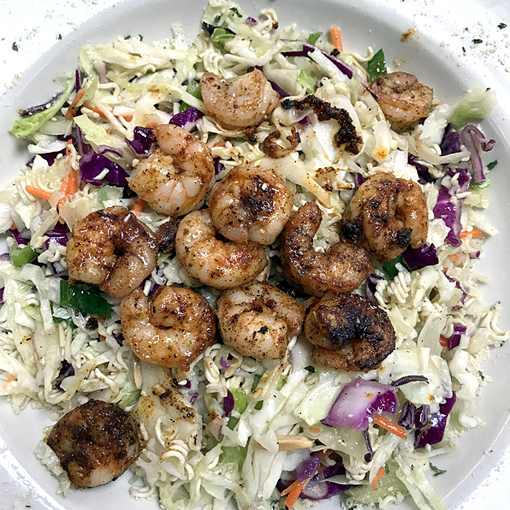 Well, the chef at Gnat's Landing either has a Cajun/Creole background or an honest love for the cuisine, because the shrimp in their famous 'Slaw Bowl' (that's mine pictured above) is beautifully seasoned! The texture from the Ramen and the fresh cabbage make this dish extra crispy, and the "Bug Juice" TANG (spell it backwards) made everything extra special! We also enjoyed orders of their awesome Fried Pickles and their Vidalia Onion Pie, which is served in small bowls and isn't a pie at all, but is totally delicious! This is a flip-flop-friendly dining destination...go relax and enjoy! One of our amazing dinners was at the casually refined Georgia Sea Grill. Owner Zach Gowen greeted us and Chef Tim shared with us the restaurant's commitment to source products from local, regional, and sustainable resources whenever possible. I enjoyed a dirty martini, served with the perfect amount of ice shards—just how I like it—and the Wasabi Pea Encrusted Tuna starter. The pickled bok choy was divine! 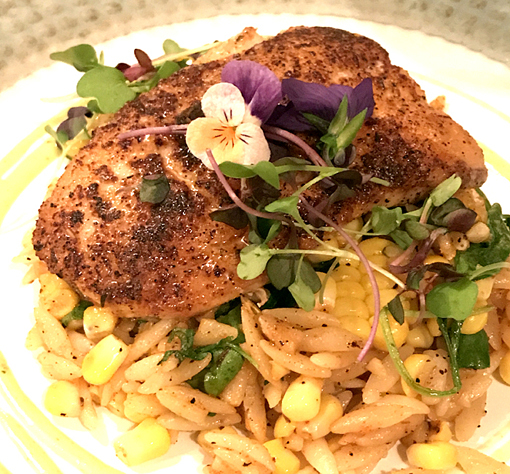 For my main course I had the "Cajun Spiced" Fresh Catch, served with orzo, fresh corn (right off the cob! ), arugula and green goddess. The fish was incredibly tender and perfectly seasoned. To this day I don't know how I still had room for pecan pie and ice cream! Immediately following our farewell "Resort Southern Breakfast" (an abundant buffet!) in the Retreat Dining Room, we engaged in a little friendly competition. Each team had 10 minutes and approximately a bazillion ingredients from which to choose to create the ultimate smoothie...it was a 'Smoothie Competition'! 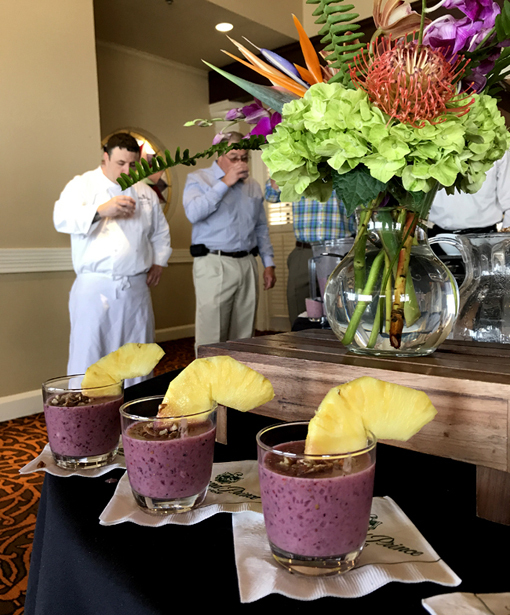 Our smoothie creation (pictured above) had more than 14 ingredients! You know those cooking competition shows you watch all the time? We found out what it's like when the clock is about to run out of time! While my team got a mention for presentation, the winning team took the prize—bragging rights—for exceptional 'smoothness' and flavor! The competition was a super fun way to spend a final few moments with new friends. "Thank you!" to The King and Prince Beach & Golf Resort, to the many restaurants where we dined, and to Leigh Cort Publicity for planning such a fantastic culinary experience! Disclaimer: While this was a hosted media familiarization trip, all opinions are my own. Still deciding where to visit and stay on your vacation? I invite you to explore The King and Prince Beach & Golf Resort's website at length, as well as to peruse their Facebook, Twitter, and Instagram accounts. I think you'll find it delicious! Outrageous journalism Travis ~ your exuberance for cuisine and dining makes your story jump right onto the plate. And oh, your photos. The best. Thank you for joining us last month at the historic wwww.KingandPrince.com and St. Simons Island, Georgia. Need to check out Chile Peppers best Mexican cuisine on the island.